Britain should deploy a “more liberal” policy towards the movement of people from India, in order to take advantage of a growing talent base, according to the chief minister of a Northern Indian state. 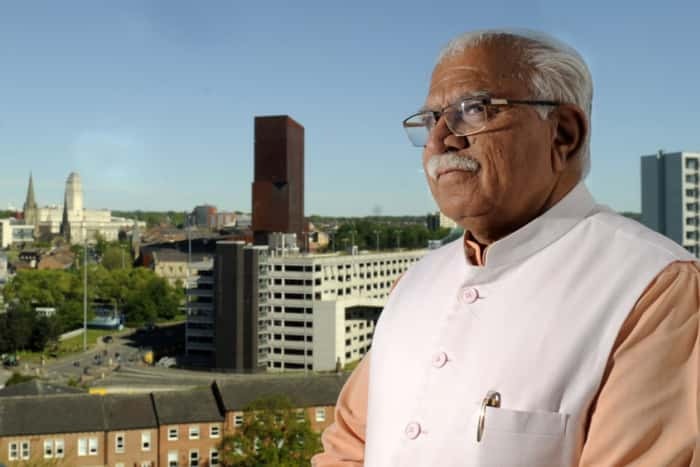 Manohar Lal Khattar, chief minister of Haryana, brought a trade delegation with him to Yorkshire as part of ongoing attempts to strengthen ties between India and the UK. Speaking through an interpreter, Mr Khattar said: “Indian professionals are highly rated. Britain can leverage that, whether in fintech, accounting, professional services or pharmacy.” The UK is ahead of India in terms of infrastructure, Mr Khattar told The Yorkshire Post, but the country’s workforce can add value to British businesses. He said: “We think that the UK is far ahead of us technology-wise and investment-wise. As far as the workforce is concerned India is ahead. We can supply the quality workforce.” However, the chief minister of Haryana called on the British Government to have a more liberal policy towards freedom of movement between the two countries. “We think the freedom of movement should become more liberal,” Mr Khattar said. Indian Prime Minister Narendra Modi is looking to establish a ‘living bridge’ partnership. A term used to refer to the movement of people, ideas, goods and services from India to the UK and back. Last year 9 per cent more visas were issued to Indian nationals to visit and to do business, compared to the previous year, and 27 per cent more visas were issued to students in 2017. The UK is looking to ramp up its exports as the country prepares to split from the European Union. Mr Khattar says that India is ready to provide opportunities to British businesses. “For the local industries here it is an opportunity,” he said. “[For] British companies that are intending to trade we can provide better platforms and opportunities in India.” On his first visit to the UK, Mr Khattar said that it wasn’t just London that provided an attraction for Indian firms looking to trade with Britain. He said that the many parts of the country that they have visited offer different strengths for India to tap into. “There are opportunities which are specific to different regions,” Mr Khattar added. The trade delegation visited Leeds, where it took part in a roundtable discussion, and then visited the Advanced Manufacturing Park in Sheffield. “There is much enthusiasm regarding this particular visit and we’d like to only intensify that relationship,” Mr Khattar said. The Federation of Asian Business, which includes the Yorkshire Asian Business Association (YABA), helped organise the event. Haryana is in the North of India, and earlier this year, Andrew Ayre, the head of the British deputy high commission to Chandigarh, the capital of Haryana, led a delegation of businesses to Yorkshire. He said: “Clearly, India is going to be a key market in the future. It’s a key market now. It will become even more important once the United Kingdom leaves the European Union.” The head of the British deputy high commission to Chandigarh believes that the UK “is open for business”. Trade currently stands at around £5bn per year between India and the UK. Around two thirds of that is Indian exports to Britain and around one third of that is UK exports to India.